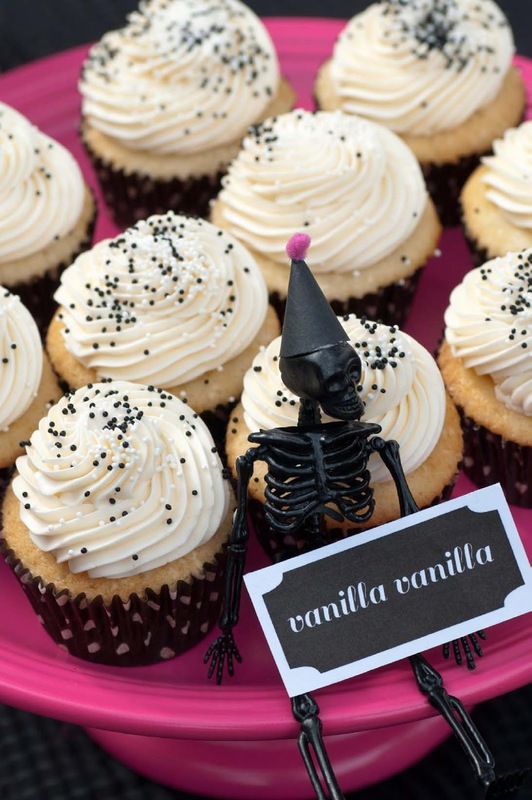 I’m so excited to sharing pictures from my son, Graham’s 7th birthday bash – A pink & black Halloween party. We had so much fun at G&M farms last year that we decided to go back again, but give it a completely different look. I asked Becca of Cake. to design a sophisticated and modern invitation with a skeleton holding an orange balloon. I loved what she designed – and so did Graham, but he requested the balloon be hot pink instead. Graham is a quirky kid and I loved how this choice reflected his personality, so I ran with it. Rather than do a bunch of desserts for the table this year, I chose to make seven different cupcakes to represent him turning seven. I found the little skeletons at the Dollar Store and spray painted them black and crafted tiny party hats for them. 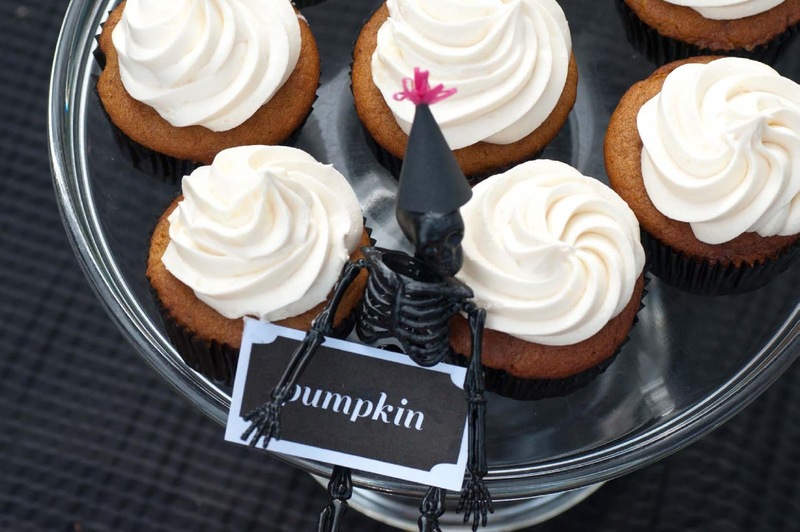 They held signs to identify all the different flavors - vanilla/vanilla, chocolate fudge/vanilla, strawberry, lemon meringue, triple chocolate, pumpkin, peanut butter cup and triple chocolate. I used a variety of cake stands from my collection to show them off. 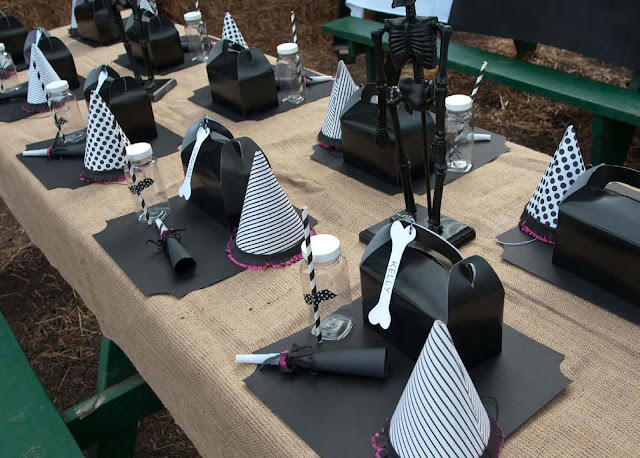 For the kid’s table, each child had a lunch box with bone name tag, a juice bottle with striped straw (for strawberry lemonade) and a handcrafted party hat and horn. I spray painted larger skeletons for the table with the intention of them holding balloons, but it was so windy at the farm it didn’t go as planned. For favors, the kids received a cd of Graham’s favorite dance music (Lady Gaga, Katy Perry, etc - sorry parents!) a skeleton bracelet, a homemade skull lollipop. Next up: Pictures of the party fun! My son's school hosted its annual Harvest Festival today and I went a little bonkers making goodies for the bake sale. I found so many tempting recipes via Pinterest, it was difficult to narrow it down. I put my Silhouette SD to great use to make all of the hang tags and tied them on with baker's twine. 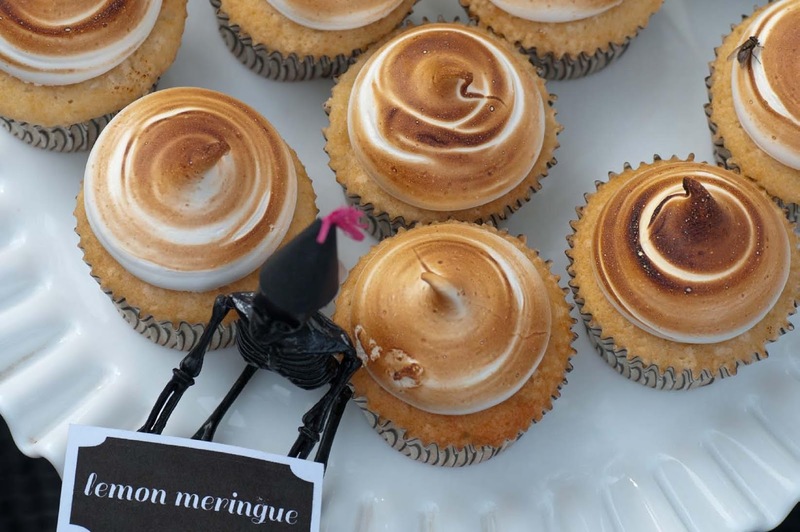 I had a fabulous time making all the treats and was happy to help raise some money for his wonderful little school. Yowza - I can't believe my baby boy is turning 7 in less than a month! 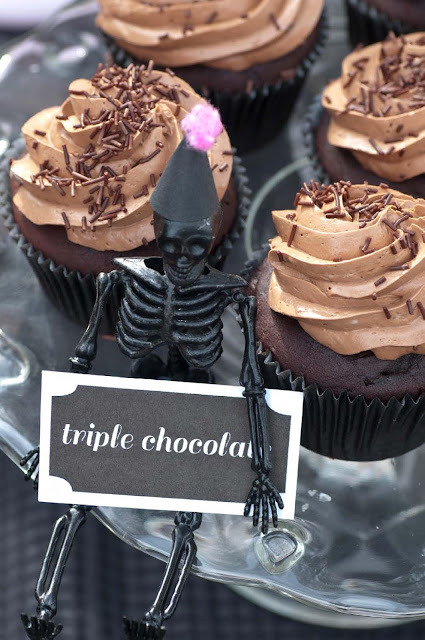 With a late October birthday, a Halloween theme has been our go to for most of his parties. We had such an amazing time last year at G&M Farms that we decided to go back again, but change up the look of the party. I wanted the invite to have a modern/sophisticated feel and Becca of Cake. definitely delivered with the design. The balloon started out a more traditional orange, but Graham requested the change to hot pink (his favorite color). I have to admit I was a bit skeptical at first. Pink and Halloween don't usually mix, but I have embraced it and love that it's quirky and fun just like him. Stay tuned for lots of party DIY's and recipes (we're making seven different cupcake flavors!). You can purchase the invite here. A couple of weeks ago, I put together a dessert table for the sweetest little 1 year old, Amelia. 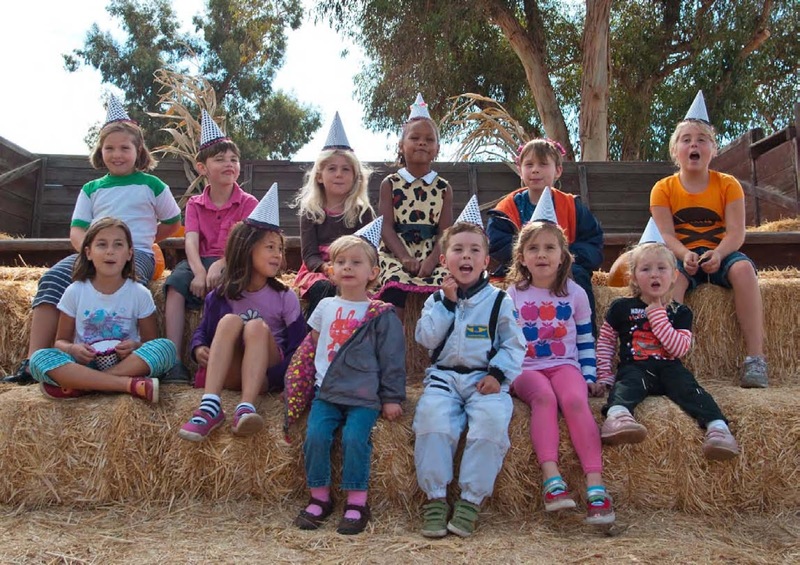 The party, held in Tilden park in Berkeley had a farm theme with a decidedly girly twist. I made a smash cake for the birthday girl, chocolate and vanilla cupcakes, brown sugar caramel corn and homemade giant Oreo cookies. Amelia's mom, Lea, an admitted Etsy junkie, provided lots of great elements to decorate the table including personalized cupcake flags, vintage farm animal tags, monogrammed popcorn boxes, and a beautiful hand sewn cake bunting (which was unfortunately a bit too big for the cake, but looked adorable hanging from the crate). Typically when I put together a dessert table, I have the design mapped out far in advance. In this case, the client was providing the table, linens, candy jars, and some of the props (hello, gorgeous wooden crates), so when I arrived at the event I had to put everything together on the fly. While it was a little nerve-racking (especially because the party was in full swing and there were lots of onlookers), it was a fun challenge and I was really happy with the way it all came together. Ok, I'll admit to jumping on the popsicle bandwagon this summer. After pinning yummy popsicle recipes for months, I finally bought these Norpro molds. I love them for their classic shape and use of wooden sticks. I don't know about you, but whenever I've bought molds with reusable plastic holders, they have all disappeared by the time I'm ready to make a second batch. I think store bought Fudgesicles are pretty delicious, but I'm always up for trying to improve on the original (especially when they are full of artificial ingredients that I can't pronounce!). I started with this recipe and just made a couple of little changes. I had some amazing Valrhona milk chocolate on hand, but you could easily substitute with semi-sweet or dark chocolate. 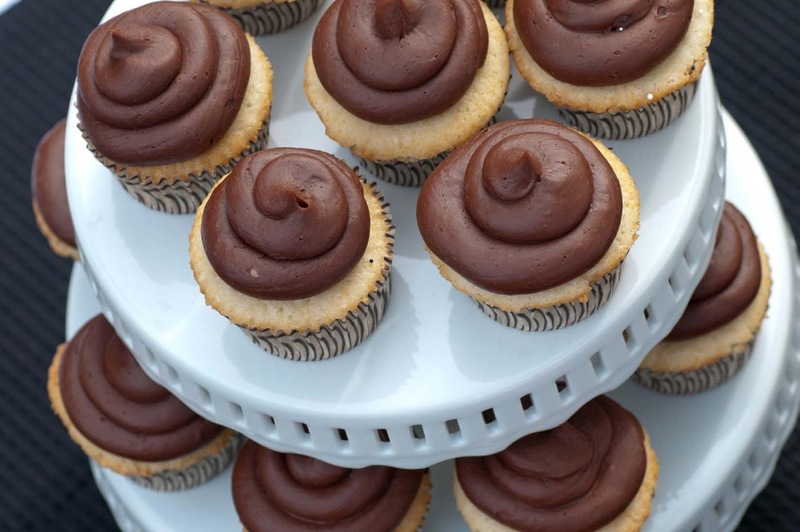 I couldn't have been happier with the results - they were so smooth, rich and super chocolatey - the perfect summer treat! 1. Chop the chocolate into small pieces and melt over a double boiler. 2. Combine the melted chocolate, sugar, cornstarch, cocoa powder, and milk in a medium saucepan. Cook over medium heat until slightly thickened, approximately 10 minutes. Remove from heat and strain through a fine mesh strainer. Stir in the vanilla. 3. Cool the mixture to room temperature then pour into 16 popsicle molds. Freeze for 1 hour and then insert sticks. Freeze overnight for best results. To unmold: Have a chilled container ready to put your popsicles in. Fill a bowl with boiling water the depth of the mold. Place the mold in the water and let sit for a couple seconds. Working as quickly as possible, wiggle the sticks and pull out the popsicles. If they seem to be melting too much, refreeze until hard and try again. I was super excited when Tea Magazine asked for my "expert advice" on throwing tea parties for kids. I was interviewed and they included gorgeous photographs taken by Sherry Heck from the tea party that I hosted for Graham and his friends. Becca from Cake. 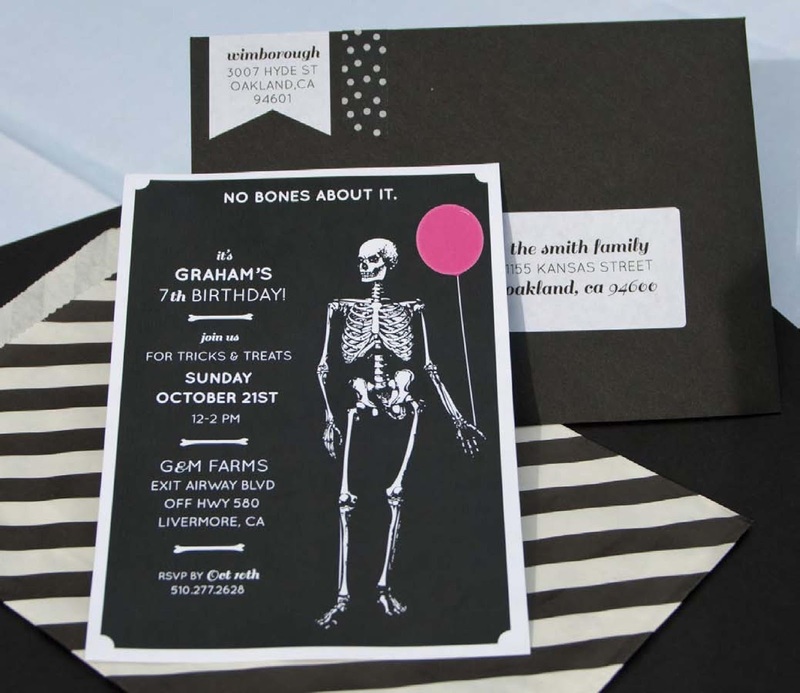 designed the invite (now available here), menu & printables and lended her styling talents. To revisit the complete party, see here. Dinner at Il Buco - Everything about this first dinner was amazing - the food, the atmosphere and our irreverent server, Johnny. Fort Greene, Brooklyn - I loved this neigborhood with all it's picture-picture brownstones and quaint restaurants. The Brooklyn Flea was my main reason for going and it did not disappoint. Housed inside a former bank building for the winter months, the place was jam packed with vintage goodies. Marlow & Sons - cozy restaurant and general store. We were too full to eat at the time, but enjoyed having a bottle of wine at the bar and picking up some delicious (and gorgeously wrapped), Mast Brothers chocolate. Highline Park: This unique park is built on an elevated freight rail line and stretches 1 mile long above Manhattan's West side. Plantings were a bit bleak when we were there, but I'm sure in the later spring/summer it is stunning. Fishs Eddy: Please see my previous post where a gush about this most amazing store. Momofuku Noodle Bar: Two words: PORK BUNS (they were devoured before a picture could be taken). Sit at the counter, watch the cooks and enjoy the inevitable kitchen drama. The Lion - Our friend, former co-worker and San Francisco native, Jonny Leiva is currently at this very swanky restaurant in the West Village. I caught up with Jonny and sat at the bar and devoured the best tuna tartare I've ever eaten. Big Gay Ice Cream: The owners, Douglas & Bryan were speakers at the DID conference and since I was staying somewhat close to their shop, I knew I needed to try it out. I snuck in moments before they were closing and ordered a 'salty pimp' - vanilla soft serve, literally stabbed with dulce du leche and dipped in chocolate. I ate it strolling back to my borrowed apartment, through the somewhat sketchy neighborhood, all alone, late at night feeling like a might be able to pass as a native. Williamsburg, Brooklyn - the main drag reminded me of the Haight is San Francisco and was more junky than I had imagined. ABC Carpet and Home: I was so looking forward to visiting this shop, but it just looked dated and disorganized. I'm sure there are some amazing items in here, but they were hard to discover in the mess. In need of a face lift! 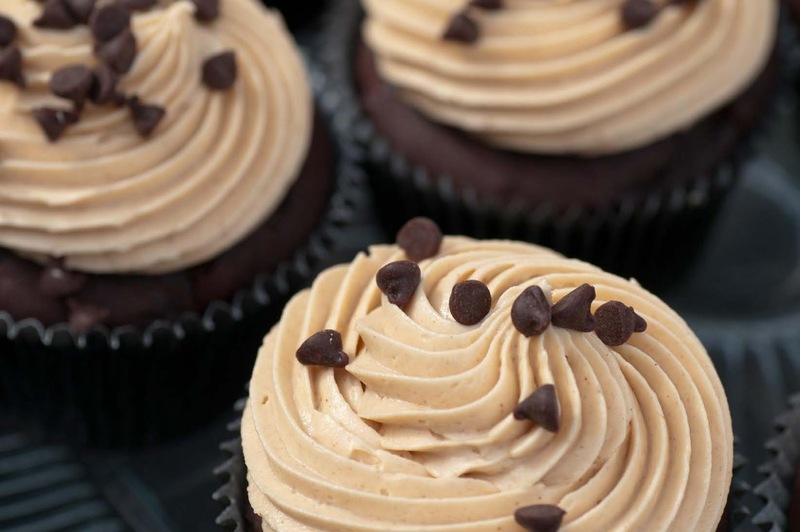 Crumbs cupcakes - Too big, too sweet and really artificial tasting. 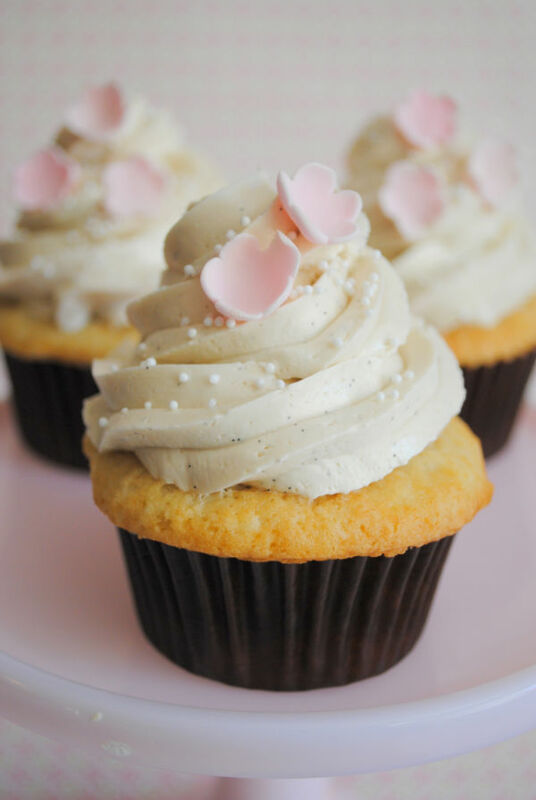 My only NYC cupcake was definitely a flop. Overall, the trip was so amazing and I am so grateful for the opportunity. I hope that it's not going to take me another 20 years to get back! (BTW, if there are any New Yorkers that want to swap houses/jobs for a year or so, we're ready to go. ).